As an added benefit, you get integration with Outlook Tasks as well, if you use this on the desktop. Anyway, the Cortana integration with Microsoft To-Do is only available in English in the UK, Australia, India, the USA (of course). 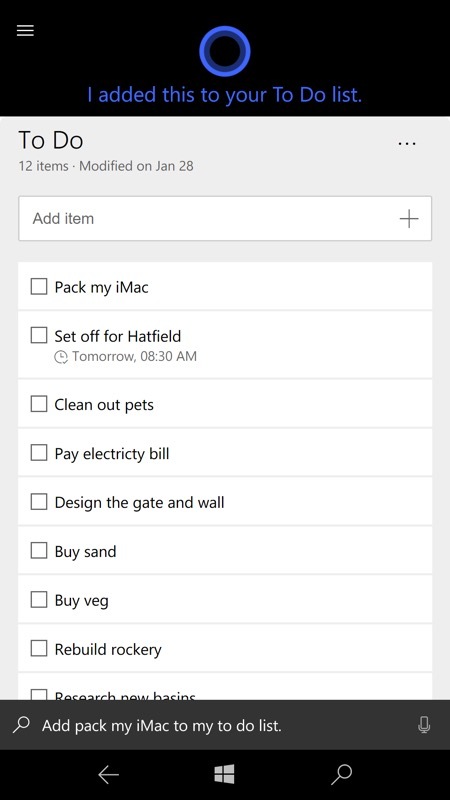 "Add 'Pack my iMac' to my To-Do list"
"Remind me to set off for Hatfield at 8.30am"
Pretty cool to see all this joined up thinking from Microsoft, if a little belatedly, some might argue. The next major Microsoft To-Do update will hopefully see file attachments on tasks, which will turn the application into a genuine mini-project manager. I can't wait. Comments welcome on this new Cortana ability - obviously this is a case of Windows 10 Mobile inheriting extra functionality from its Desktop and ecosystem-wide sister platforms, but it's very welcome nevertheless. Hopefully it'll be available in other languages and regions in due course.